Powers/Abilities: Superhuman strength, able to fly. Fires beams of force from her eyes ("optic blasts"), but use of this drains her life energy, and she can only do so for a short while before needing to rest. Comments: Created by Mauricio Hunt. 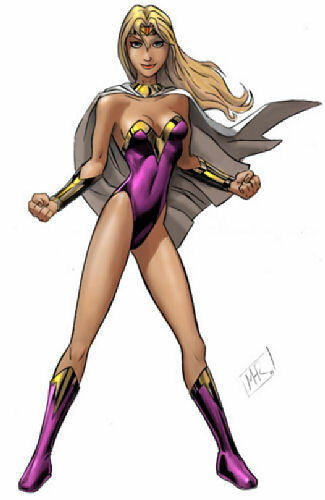 Though she apparently debuted as a guest star in AC's Femforce title, it should be noted that she is not an AC comics character. Kinetics will be appearing in the War of the Independents.